Simply put, bleed is a slight overlap or extension of the printed area added beyond the borders of a printed page to make sure graphics or solid colors go right to the edge after trimming. If you design the page without blocks of color, photos or graphics going right to the edge of the page, you don’t need bleed. But if you do, and you don’t want a slight error to cause the cutter to miss the edge and leave white around the edges, you’ll want bleed. Most home and office printers cannot print to the edge and will leave a white margin, cutting into your design. If this is good enough for your purposes, read no further as you do not need to add bleed to your design. For borderless, professional printing, bleed is required by most commercial printers, and is recommended for the highest quality print output. Before you start adding bleed to your design, be sure you do not have important design elements or text boxes closer than 1/8 inch to the inside edge of your document. Staying within this safe zone ensures your design will not cut off important content after printing and trimming. 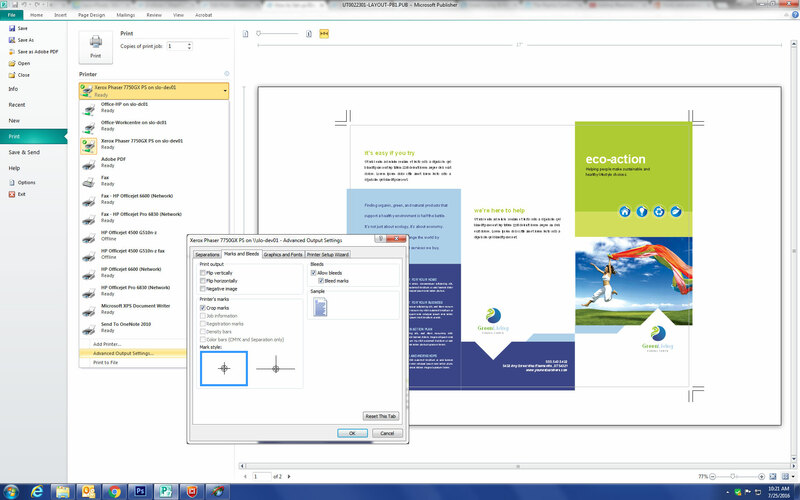 To ‘fake’ a bleed in Publisher you will need to change the paper size, adjust the graphics and then return the document to the original size before creating a PDF or sending your .pub file to the printer. Start by opening the Page Setup dialog box. Go to Page Design > Size > Page Setup. Under Page, enter the dimensions required for your document. You need to add 1/8 inch (.125″) of bleed on all four sides of your document. This will add an additional 1/4 inch to both the width and the height of your document. For example, if your document is 8.5″ x 11″, your new document size will be 8.75″ x 11.25″. Next, adjust the graphics to the edge of the document. You may scale vector objects, but be sure you do not distort photographs. Use the crop tool where possible. 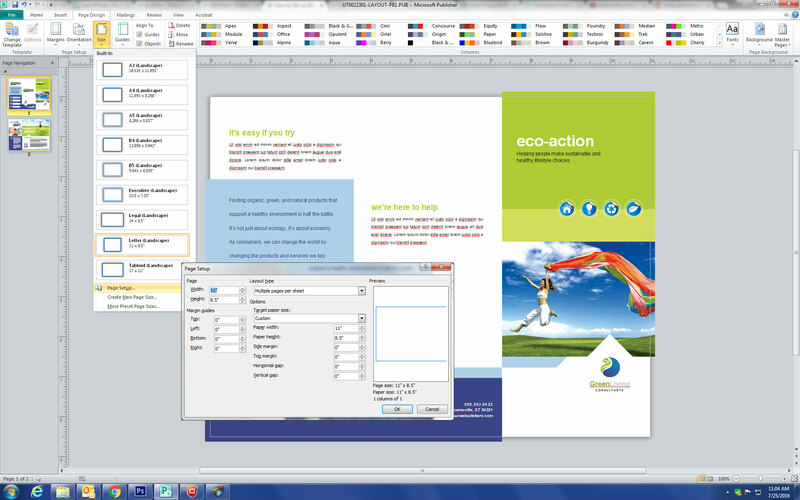 Grouping graphic elements will allow you to move elements together and make the adjustments quicker. Once you have adjusted your design, change your page size back to 8.5″ x 11″. The graphics touching the edge will then extend beyond your publication page by 1/8 inch. If you would like to print your design with bleed, follow the setup instructions below. Remember that you must print your document on a larger sheet of paper to allow for your bleed and crop marks. On the File menu, click Print, and then select a Printer. Click Advanced Output Settings, and then click the Marks and Bleeds tab. Select the Crop marks and Allow bleeds check box, and then click OK. While it is possible to print a Microsoft Word document with bleed, the process is tedious and not recommended. You can follow the steps above to create a document size large enough to accommodate the bleed, however Word does not allow your document to extend past the document size and does not offer a way to include crop marks. Check with your printer for their specifications and requirements if you choose to use Word. If your printer is not able to help, try Printingforless.com. They will work with you to get your design professionally printed. 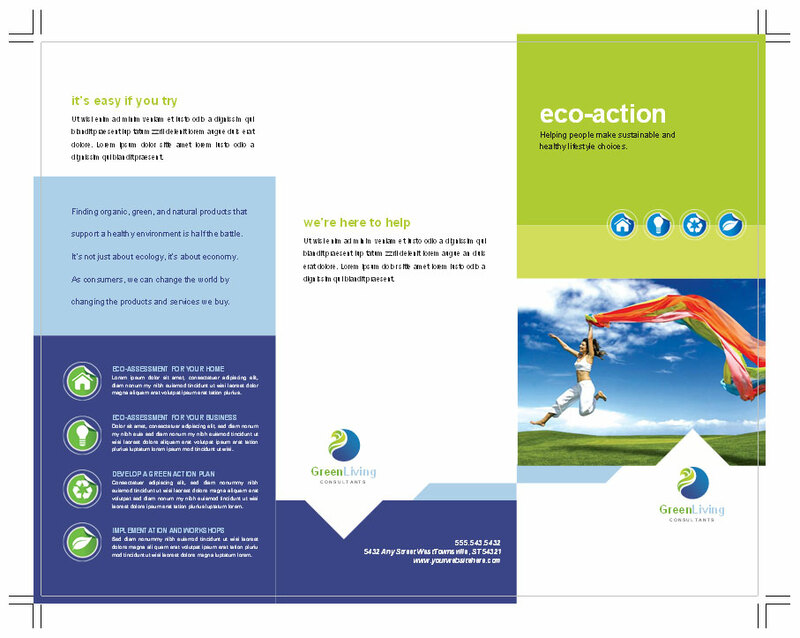 StockLayouts offers professional print templates which are designed to allow bleeds and are suitable for commercial printing.